I hope ice cream is a passion with you just like it is for me! Then stay around and be connected with my pages. I have been an ice cream addict for the longest time ever. My favorite ice cream bar was a juicy orange colored, tangy lolly bar from the yesteryear Kwality ice cream range. A warm memory I have, is that of this dark maroon, say a lovely burgundy colored, absolutely delicious candy like ice cream bar, called the Cocktail stick.My school days got much excitement during every short break when I bought this bar and slurped it slyly in a well-found corner. The first of my ice cream trails, begin as I trudge into the BASKIN ROBBINS parlour, one of the premium ice cream chains in India and internationally. These bright pink and deep blue highlighted, outlets aptly spread their motto HAPPYNESS IS HERE, through their abundant selection of ice creams. BASKIN ROBBINS is the world’s largest speciality ice cream chain. They operate on the unified identity of 31 flavors, one for each day of the month.This international ice cream brand was founded by Burt Baskin and Irv Robbins in the United States Of America, to create ice cream of the highest standards with unique taste and flavours. Though chocolate is my all time favorite flavour when it comes to ice creams……I decided to explore the new FRUITY flavours at Baskin Robbins. LIME N LEMON COOLER..…turned out to my most adored flavour. This tangy, refreshing sorbet is a real treat in this summer heat. Twanged with bright colours of yellow and green, it has bits of orange zests that add an extra ounce to its overall appeal. BERRY BREEZE is a blushing pink ice cream with the triple taste of black currant, blueberry and strawberry. An intense fruity thrill can be experienced with a bite of this ice cream flavour. HAWAIIN FRUIT SHOWER is a blend of colourful Orange, Pistachio and Banana ice creams with a swirl of orange sauce. Its description in just one word is SLURRP ! BASKIN ROBBINS ice creams are pure vegetarian and their large range of flavours is supported by a backup of desirable sauces and toppings. I sign off my Ice cream trail with a smile…….Baskin Robbins surely spread its HAPPYNESS into my world! If you need a refreshingly cool experience in this hot Indian summer….do step into any of the 730 ice cream speciality parlours of BASKIN ROBBINS INDIA. It’s going to be a fruit filled, colour bursting ice cream joy ride……believe you me. As I head to The Oberoi,I go past the drive, seeing the shimmering ocean……I feel the winter breeze kissing my cheeks and saying its final good bye. The Oberoi at Marine drive…..has one of my all time favourite bakery and pastry shops in this city. In the past I haunted this patisserie and delicatessen…I often, visited it for a cup of coffee to chat with friends, to have a bite of their sandwiches when I worked in the vicinity or just to taste their signature desserts and confections.I could say, I patronised it in its various avatars. Tastings for my Mumbai Bakery Trail #2 started here today. As I enter……I see a beautiful display of perfectly crafted pastries and chocolates. Upon her request, I taste the Maracaibu chocolate tart……Two large chocolate macarons sandwich a Chocolate mousse and raspberry layer, that is coated with a ganache glaze. One look at this and you are floored by the perfectly made pure chocolate fans. 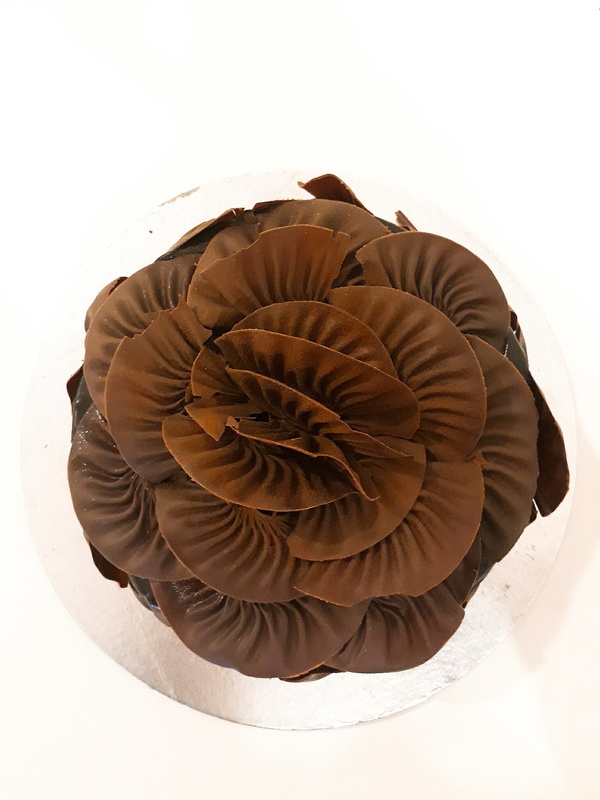 The beautifully crafted chocolate fans, completely cover this cake, which is layered with chocolate mousse,chocolate chip meringue and a dark chocolate glaze. Its taste can be described in just one word…..MAGIC ! Their mini Hazelnut Praline cake looks appealing and I discover,it has a Chocolate mousse with a centre of passion fruit cremeaux, nested on a base of vanilla sable. But the hazelnuts coated liberally on the mirror glaze loose their crunchiness. I would definitely skip the sourish passion fruit filling centre (chef says some of her guests request for this tart filling) and add a crispy hazelnut crousillant instead. For me the best example of a hazelnut treat is the addictive Feraro Rocher a signature Italian confection, popularised by Ferrero SpA.Roughly 3.6 billion of Ferrero Rochers are sold each year in over 40 countries. The very giving combination of hazelnuts, milk chocolate, crispy wafer and hazelnut Gianduja always works for me ! My eyes spot the Papparoti……described as a subtle sweet bread with a blob of salted butter,that is topped with a unique mildly scented coffee crumble. Chef Prerna suggests I warm this for a few seconds in a microwave and then teeth it. I pick the Papparoti and the Key lime strawberry tart,for my Home Test. Tastes and presentations that are on par with the best in the world. Thank you chef Prerna for the lovely informal chat and inspirational viewing of pastries, many of which can be honored !